Happy 123rd Birthday, Johnny Dodds! (4/12/1892). 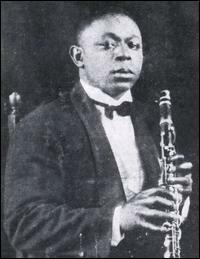 Clarinetist, Johnny Dodds recorded with King Oliver’s Creole Jazz Band on the Gennett label in 1923 and the State Street Ramblers in 1927. The State Street Ramblers’ “Cootie Stomp” appeared on Gennett 6232 and featured Natty Dominique (c), Johnny Dodds (cl), Jimmy Blythe (p). It was recorded on 8/12/1927 in Chicago. This entry was posted in April, Gennett and tagged April, Gennett, Gennett 6232, Gennett Discography, Gennett Records, Jimmy Blythe, Johnny Dodds, King Oliver's Creole Jazz Band, Natty Dominique, State Street Ramblers, The State Street Ramblers. Bookmark the permalink.